I have to state I am not a big breakfast person. I like breakfast food but not in the morning. Like bring on pancakes at dinner and I am super happy but before yoga - no thanks! I am just not a morning person to begin with so breakfast should not get all offended. 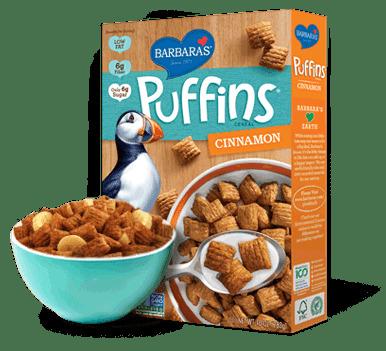 So today I had a bowl of cinnamon Puffins with cashew milk and some orange spiced tea. I ate while watching the news, saw Matt off to work and then worked out. That is how I typically start my Monday through Friday mornings. I'm a morning person so breakfast is my most anticipated meal of the day, not that I ever do anything special for it I'm just like 'what can I eat right now!' but dinner is hit or miss. Puffins look good and crunchy, I've never had them. I was a cherrios kid and rice puffs with frozen blueberries so the blueberries would get coated in frosty vegan milk, I need to revisit that! I've never seen Puffins in the UK, but they look delicious! Breakfast is my favourite meal of the day, I always wake up ravenous. A big bowl of these would be a great start!